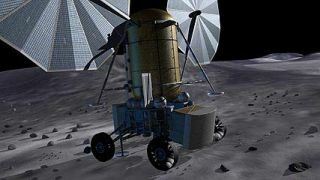 Robotic precursor missions to the Moon, such as this lander seen in a new artist's rendering, are planned prior to the return of human visitors..
Editor's Note: NASA formally announced its back-to-the-Moon plans Monday. BIG SKY, Montana - NASA is set to unveil today details of its new space architecture, a "how-to" response to President George W. Bush's Moon, Mars and beyond vision speech made in January 2004. Bush called for putting astronauts back on the Moon by 2020 and sending humans to Mars thereafter. Last week SPACE.com and Space News reported that NASA will announce today plans to send four astronauts to Moon in 2018. More detail was provided here this weekend at a meeting of NASA officials and other space planners. On the list: A re-usable vehicle that's safer than the shuttle; technology for extracting fuel from the destination; and an airbag landing upon return to Earth. Plans were also detailed for sending robotic scouts first. Aspects are somewhat vintage Apollo in approach, but with numerous technical twists. For example, a four-person lunar expedition crew would make use of a Crew Exploration Vehicle that is outfitted with solar panels. The astronauts would rendezvous in Earth orbit with a pre-launched Earth Departure Stage, and then make the outbound voyage to the Moon. Once in lunar orbit, all four crewmembers would ride down to the Moon in a lander. They would depart the Crew Exploration Vehicle, putting it in autopilot mode as they spend seven days on the lunar surface. In comparison, six two-person teams landed at the Moon's equatorial region in the 1969-1972 timeframe as part of Project Apollo. Each expedition had an additional astronaut who remained in lunar orbit. In NASA's new return-to-the Moon scenario, astronauts will cover much more territory than Apollo moonwalkers. A key goal is to use water ice that may be stashed within permanently shadowed craters at the Moon's poles. Each team of Moon explorers would leave behind essential components for later use, as well as equipment that could constitute a lunar station. That base could well mirror the type of encampment now situated in Antarctica. As a cost-saving measure, the NASA vision embraces the use of hardware and production capabilities embedded within the space shuttle program, to be closed down in 2010. But the initiative also relies on harnessing a suite of advanced technologies: from self-diagnostic gear for boosters and sophisticated medical equipment for astronauts to on-the-spot processing hardware that churns out fuel, water and oxygen supplies from lunar resources. Down the road, the same approach would be used on Mars. "This is a go-as-you-can-afford-to-pay kind of program," said Rex Geveden, NASA Associate Administrator. Last week, the White House "green-lighted" the plan, he said, giving NASA Administrator Michael Griffin the go-ahead to proceed with rolling out details to Congress and the public. Geveden joined current and past NASA officials, university and industry experts in the Inland Northwest Space Alliance (INSA) Space Policy Institute meeting, held here September 16-18. The Missoula-based INSA is a private group created by the University of Montana in 2003. INSA is focused on broadening space-related research and commercial applications, particularly in the inland northwest. NASA's new space vision is one where "schedules are the independent variable," Geveden said. That's in contrast with the Apollo program where schedule was fixed and cost was variable, he said. "We can't dial the cost here, in this case. So we've had to focus on affordability," Geveden added. Doing so means drawing upon a heritage of available hardware and workforce, he said. For example, the still-to-be-built, post-shuttle Crew Exploration Vehicle (CEV) is capsule-shaped and would sit atop a four-segment Solid Rocket Booster -- a space shuttle component flown 178 consecutive times with no failures, Geveden noted. The CEV will be tipped by an escape tower. With that tower, the capsule could be pulled free from a troubled booster ride. That hardware provides ten times a factor of safety than the space shuttle, Geveden explained. An Earth-returning CEV would toss off its reentry shield after its fiery plunge. A parachute system would deploy, followed by a set of airbags to cushion the craft's touchdown on land, somewhere in the American West, Geveden said. Ocean recovery - like that done in the Apollo effort - is considered a contingency mode, he said. A heavy-lift, cargo-only booster would also be shuttle-derived. That launcher incorporates the large shuttle external tank, use of a cluster of five space shuttle main engines, straddled by two five-segment solid rocket boosters. It would toss into orbit loads of hardware, like the CEV's Earth Departure Stage. Geveden told SPACE.com that tapping shuttle hardware does not equate to maintaining today's entire shuttle workforce. "We can't have 10,000 people on the ground at the Kennedy Space Center," he said, integrating payload and launching that system. "That's not affordable," Geveden said. "The future workforce for launch vehicles can't be as big as it is for shuttle." In order to become leaner in mission launch and operations, Geveden added, more automation through better software, smart sensors, and greater test and checkout technology to ready boosters for flight is critical. However, the shuttle derivative hardware - the CEV booster and heavy-lifter - must draw upon the existing tooling and fabrication facilities, supply chains, and workers to build those components or modify them, Geveden said. The long march to Mars will be challenging. Geveden said 500-metric tons of fuel and structure have been scoped out in the NASA plan for a projected humans-to-Mars flight. "One of our objectives will be to put a chemical plant on Mars", Geveden said, alluding to machinery to extract rocket fuel from the martian atmosphere for a return trip. In this regard, liquid-oxygen/methane burning engines are part of the lunar piece of NASA's vision. Those engines can be used for use on the martian surface, given the local resources on the planet, he said. In moving from lunar stays by astronauts to a humans-to-Mars outing, will the Moon become discarded real estate in the process? "I don't think it's a foregone conclusion that you may have to abandon the Moon," Geveden told the INSA audience. "What we're headed for on the Moon is a South Pole analog...some kind of camp that we set up and sustain ourselves for months at a time, not years." Geveden said that thousands of people-hours went into charting the new NASA Moon, Mars, and beyond architecture. "We have animations. We have a very sophisticated study with data. It's a deep analysis, he said. "But having said that...now we need people to take this from the concept stage to the time we're actually building hardware...and getting ready to launch these systems," Geveden concluded. An early element of dispatching people back to the Moon is sending robots. Scott Hubbard, Director of NASA's Ames Research Center -- located in the heart of California's Silicon Valley -- said he and colleagues have been assigned the responsibility for the robotic lunar exploration program. The first mission in the robotic lunar cue is the Lunar Reconnaissance Orbiter in 2008, Hubbard said. Following up on those findings are robotic landers, with Ames managing the suite of missions to assure that they are carried out successfully, he said. "The point of the robotic lunar exploration program is engineering...technology testing and demonstrations...to prepare for human exploration," Hubbard told SPACE.com. "It's not a science program. It will get us ready to return people to the Moon." Items like lunar processing, precision landing, integrated health monitoring and management - these are items that can benefit from technology not available in Apollo-era exploration. "The important point is that this is not developing technology for something way in the future," Hubbard said, but for getting people back on the Moon in the 2015-2020 timeframe. "The Moon is just three-days away," Hubbard said, a distance he's already covered vicariously as the former NASA mission manager for the Lunar Prospector robot. "That means you don't have a lot of time to do operations planning and software code writing en route. You've got to be ready to go...because whatever you've got, it is going to be used three days later." Yawn of a new era? Selling the vision won't be a cake walk. That was one take-home message from former NASA Chief of Staff, Courtney Stadd, now President of Capitol Alliance Solutions, a management consulting services firm located in the Washington, D.C. area. "The challenges facing successful implementation of the exploration vision are formidable," Stadd said, "ranging from budgetary to the noise-signal ratio of competing priorities facing the political system." Stadd said that he viewed NASA's Griffin and his leadership team as "literally the best in a generation in terms of being equipped to confront these and other challenges to turning the vision from Power Point charts to reality." That talent will be central to effectively navigating through the challenges facing the new exploration initiative in the months and years ahead, particularly moving the vision through the legislative and executive branches of U.S. government, he added. Reaction to NASA's new visionary agenda at the INSA meeting was mixed. But the feedback seemed more a matter of age. From several university students, "where do I sign up" was common. From others more senior, "yawn of a new era" seemed to rustle through the audience. "It looks to me like the Alzheimer's program...for those that don't remember Apollo," said one participant.